As you’ve probably heard by now, Senator Max Baucus announced today he will not run for re-election. 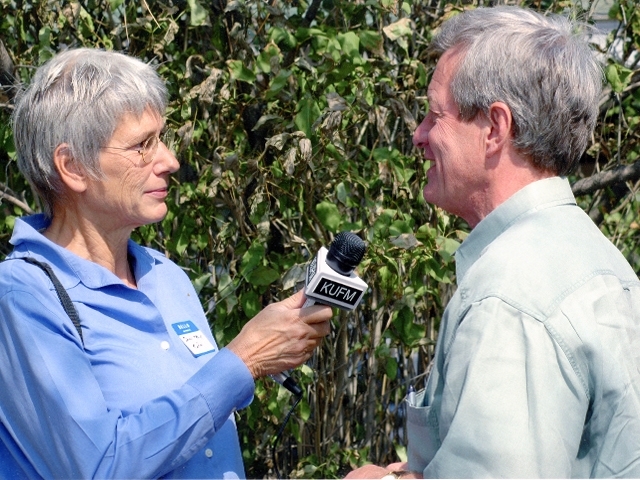 Baucus has served in the U-S Senate since 1978 and is Montana’s longest-serving senator. We’re of course working on that story for this evening’s Montana Evening Edition newscast at 5:30. Senator Baucus will return to Helena for a public announcement on Friday. Reporters and editors note: please Baucus’ biography below and lifetime achievements attached. “Serving the people of Montana has been the greatest honor and privilege of my life. Over the past 35 years I have been lucky to go from working for just under 800,000 of the world’s best bosses to more than a million – and I am grateful to each and every one of them for the opportunity they have given me. “When I first asked my hero and mentor Mike Mansfield whether I should run for U.S. Senate, he told me it would take a lot of hard work, a lot of shoe leather, and a bit of luck. In the next year and a half, I want to spend all my hard work, shoe leather and luck working for the people of Montana instead of on campaigning. “So, after much consideration and many conversations with my wife Mel and our family, I have decided not to seek reelection in 2014. I will serve out my term, and then it will be time to go home to Montana. “But, I’m not turning out to pasture because there is important work left to do, and I intend to spend the year and a half getting it done. Our country and our state face enormous challenges – rising debt, a dysfunctional tax code, threats to our outdoor heritage, and the need for more good-paying jobs. “I’m ready to roll up my sleeves and get to work. I will double down on legislation to permanently protect the American side of the North Fork watershed and keep the Rocky Mountain Front the way it is for future generations. I am going to put everything I’ve got into leaving Montana with strong Highway and Farm Bills that support jobs in our state. And I’m going full steam ahead to put on the best Economic Development Summit yet. “At a national level, I will continue to work on simplifying and improving the tax code, tackling the nation’s debt, pushing important job-creating trade agreements through the Senate, and implementing and expanding affordable health care for more Americans. “Deciding not to run for re-election was an extremely difficult decision. After thinking long and hard, I decided I want to focus the next two years on serving Montana unconstrained by the demands of a campaign. Then, I want to come home and spend time with Mel, my son Zeno, and our family enjoying the Montana public lands we’ve fought hard to keep open and untarnished. Montana’s senior U.S. Senator, Max Baucus is a fifth-generation Montanan who was born on a ranch outside of Helena, raised under the Big Sky and has dedicated his life to fighting for Montana values. In 1972 Max served as both Executive Director and Committee Coordinator for Montana’s Constitutional Convention, which crafted what is considered one of the most well-balanced state constitutions in the Nation. In 1995 and 1996, he walked the entire 820-mile length of the state. In 2009, Max was sworn in for an historic sixth term in the United States Senate – making him the longest serving U.S. Senator in Montana History. Max understands that values of hard work, faith, family, and community. That’s why he does “Work Days” as often as he can with a local business in Montana. Max spends a full day working alongside Montanans to gain a better perspective of the challenges they face. Over the years, he’s done Work Days on farms and ranches, at butcher shops and pharmacies, schools and construction sites. His signature work ethic has routinely earned him a seat at the table helping solve the nation’s most pressing challenges. Max has used this powerful post as Chairman of the Senate Finance Committee to help cut taxes for Montana families, protect Social Security and Medicare, expand health care coverage to our nation’s most vulnerable, and open foreign markets to Montana’s high quality products. Baucus has also taken a leading role on the Highway Bill and the Farm Bill, which are essential to Montana jobs and infrastructure. While Baucus remains an influential leader on national issues, he’s still driven by the same principle that he ran on in 1972: Doing what’s right for Montana. Fighting for justice in Libby remains a case in point of Max’s commitment to Montanans. Almost 10 years after meeting Libby resident and asbestos victim Les Skramstad, Baucus spearheaded the effort to have the EPA declare Libby a “public health emergency” under the Comprehensive Environmental Response, Compensation, and Liability Act (CERCLA). Baucus then secured free health care coverage through Medicare for Libby asbestos victims in 2010. He has visited Libby more than 20 times and vowed to continue the fight to bring justice to victims of W.R. Grace. Max has stood up against efforts to target women’s health programs and worked hard to expand preventative care for Montana families. He has also been a longtime and steadfast champion for labor by discouraging threats to roll back the Davis-Bacon Act. And Max has led the fight time and again to protect Social Security from the threat of privatization. This Congress, Max declared “war” on veterans unemployment by introducing his VETs Act to help veterans transfer military training to the civilian workforce while streamlining tax credits to businesses that hire veterans. Max is also committed to boosting Montana’s education system and fighting to increase access to public lands important to hunting and fishing. He will continue using his roles on the Finance, Agriculture, Transportation and Environment Committees to fight for rural priorities and make sure Montana has a strong voice in the U.S. Senate. Today’s announcement was broken by the Washington Post and – as you could imagine – is receiving widespread coverage. Politico’s Alexander Burns mentions some of the factors that could have potentially made for a tough a re-election bid for Baucus. This entry was posted in News and tagged Baucus retires, Max Baucus, Politico, Washington Post by Edward O'Brien. Bookmark the permalink.